The tragic tale of love, pining forever, but never finding their happy ever after, is something that has inspired writers ever since Shakespeare with his tale of Romeo and Juliet. In India, we have an older version of this tale in Layla and Majnun first written down by Nizami Ganjavi in 1188. In Hollywood, countless movies seem to be made or inspired by Romeo and Juliet and of course how could Bollywood miss out on the chance to bring this to audiences with the story of Layla and Majnu. Whether it be Rishi Kapoor’s 1976 version, the brilliant nautanki in Madhuri Dixit’s Aaja Nachle or the recently released 2018 film Laila Majnu, the original great tale of Layla and Majnun, tells of the ill-fated lovers, brought together by love, divided by their families and driven mad by Majnun’s undying devotion for his Layla. Unlike a lot of stories where the music either breaks up the writing or becomes an accompaniment, the music of any Laila and Majnu film is critical to the telling of this story. Thus, the producers have taken a risk by introducing new music directors but knowing that each is a well-known and respected artist in themselves, it brings both seasoned knowledge of the audience and a fresh perspective on this 900+ year old tale. 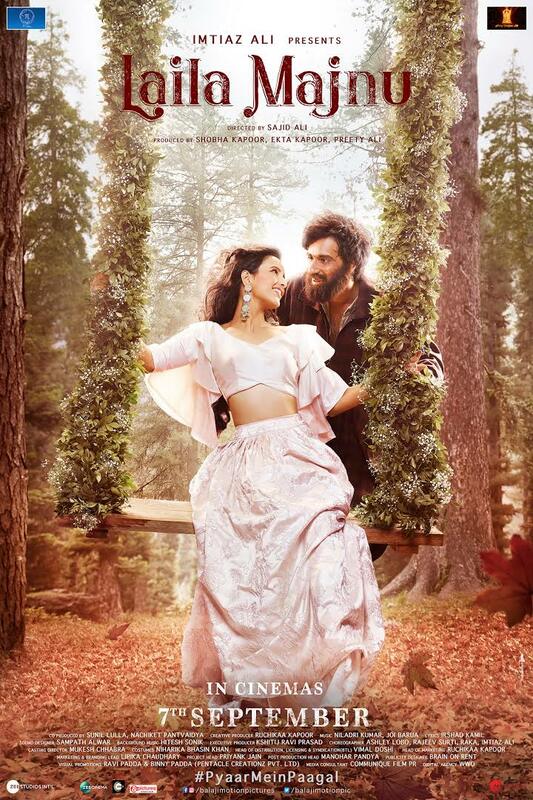 In 2018, Laila Majnu’s soundtrack has 10 songs written in conjunction by Sunidhi Chauhan, Joi Barua and Niladri Kumar. Their first song comes in slowly, slowly. The music based on violins, synth and keyboard is gradual but builds and in doing so Aahista comes alive with the powerful voices of Arijit Singh and Jonitha Gandhi. These two singers take full control over the rhythm and melody while the beat continues under them undeterred by them. This leads to two problems in this song: Arijit finds himself lacking while dragging the song home and because the lyrics never quite mesh with the beat they are hard to keep on top of. Still, this is certainly the feature love song and well worth a listen for those already in love. The familiar drone of Atif Aslam is up for the next song O’Meri Laila. Almost a devotional song in his vocal performance, Atif is backed by a folk sound created by accordion, janglestick and rabab. He is joined by Jyotica Tangri. There is a mix of Urdu and Hindi lyrics that and this should be obvious is about the boy chasing the girl when he realises for the first time he needs her in his life. The problem is of course that this is a very happy tune with lots of open air, countryside driving feelings while Atif is not a singer of these kinds of song due to his voice. This leaves the song again feeling like the singer and beat are not together. Nevertheless, this is also well worth the listen even if just as a drivetime tune. “Aakhen bole… ho lab pe khamosi”. With these words Atif is back in his element in Tum. The trend of the beat not matching the singer continues here with sweeping winds and a xylophone style instrument giving way to rabab and a heavy drum, a heartbeat. He is close at this stage, but he hasn’t won her over yet. The beat takes one more turn towards the Arabic. However with the words being so far away from this beat, this song really does feel heavily disjointed and let’s things down a bit. So, lets pick it back up with Hafiz Hafiz which incorporates heavy Kashmiri influence with traditional lyrics and even more traditional instruments. “Bas ishq hua hai, koi marz nahi” sings Mohit Chauhan in his distinctive vibrant baritones. Because the song seems to come at the listener at a 100 miles an hour, it’s hard to pick up initially that the song is very repetitive and doesn’t go anywhere at all. If the audience can get past this singing to the beat there are 2 distinct drums giving an even pace thus allowing for the lyrics to be heard a bit clearer and seeing them for the beauty that they are. He has won her over! Of course, we must have the next song Sarphiri. Shreya Ghosal and Babul Supriyo are teamed here with a piano and rumbling very dull bass noise. This breaks open into a drum and harpsichord like sound as she tries to explain to him that she isn’t like the other girls. This is the love song from Laila’s side of things, where she says you may love me but get to know me properly first. Some of the lyrics are very clever as to how they switch if you aren’t listening carefully and certainly both singers do a very good job in retaining the mystery of it. In the end this song is only different though and not brilliant as once the curtain is pulled back there really isn’t a lot that was being hidden. Onwards to Gayee Kaam Se. This could be a friend’s song like it was done back in the 60s. An accordion and tabla oversee the rhythm for the most part except for the choruses where an electric guitar takes command. Dev Negi, Amit Sharma and Meenal Jain all have a part to play as male lead, female lead and audience. Each has their own part to play as they present their perspective on the current situation. Meenal Jain gets a whole dream sequence to herself as the song abruptly disappears off into the clouds for the female perspective on things. As the last of the fun songs, this is a disappointment but maybe that’s to prepare the audience for the pain to come. Now we turn to madness. Lala Zula Zailo opens with Frankie (Kashimiri) singing traditional lyrics that are ill-fitting to the electronic beat placed under them. The words themselves do not matter, there is both a feeling of groove and bitter sadness. Joi Barua takes up the baton and gives the listener a Hindi rendition whose beat seems to instantly change. Sunidhi Chauhan who picks up the song without missing a single beat in the way that she is expected to but it ends up feeling like an English song was fused together with some classical Kashmiri tones so for that it loses points overall. Seeming to put its head above the precipice of the dark hole is O’Meri Laila – Radio Version. Joi Barua shows of his pop star skills as he takes the same tune from Atif’s earlier song with the same tempo and gently changes out the instrumentation. This introduced with a harmonica and lighter beat, a drum and clapping sounds takes better account of a more alive singer. This sounds like a pop song you might hear on the radio but still this is not a happy song… the spectre of fear and misery seems to be hanging over it but not yet won. Then the team take Tum to a new level introducing Javed Ali to this album. This is exactly the same song as what Atif sung earlier, however with Javed’s even more supple tones and a change to a synth beat holding up the background, this song drives down the hole of darkness hard as if audience ears had a bungee and jumped in. In relation to the original version, this makes for a much more internal look at some beautiful lines of poetry. But the final song of this album takes the cake for darkness. Piano strings and the sweeping wind soundtrack give the backdrop to Katyu Chuko. Mohammad Muneem gives despairingly said Kashmiri lyrics. Again, what is said in the song is not what matters here, only the feeling that the end has either come or is very near. A haunting melody that will leave you with despair, stops abruptly… it is a song that will get into your bones and shake them if you let it. It is believed that when Nizami Ganjavi wrote Layla and Majnun, he was simply putting on paper an old Arab/Persian tale of an even older age. Yet, in the number of times and ways it has been done in film, audiences never seem to tire of its epic story and tragic tale, told by its inimitable music. Even here in 2018, this album seems to stand out, not just because of the different nature of a lot of the songs but also with the care that has been taken over getting the feelings right. There is much to be desired in how the songs have been put together at a technical level, but this is a soundtrack to be felt, not understood.